The is a post I originally wrote in July of 2008. I thought it would be good to reprint it. I like this post and it has one of my favorite subjects in it – Roving is not Combed Top and visa-versa. You can thank this post to a discussion on Ravelry. I never really thought people would take “well” predrafting to mean that they needed to predraft to the point that they don’t draft at the wheel or spindle. Well prepped fiber doesn’t NEED to be predrafted. The main reasons to predraft are to make something easier to handle or to get a color variation you want. Yes, if you’re new to spinning doing a lot of predrafting may help you, but don’t do it to the point that you aren’t drafting at the wheel at all. Let’s start with combed top. There are a bunch of ways and a bunch of reasons to do each way of predrafting. You can spin from the fiber any way that you wish. Depending on how compact it is will depend on how much predrafting you need. Color in handpainted top is one of the key reasons to pick a different method of predrafting. Do you want long color sections or short color sections? Or any variation in between. Each one will produce different results. You can probably tell that just that little bit of difference, the colors will act differently in the singles yarn. An example of compact top is a merino that I carry. It’s a really dense top that you just can’t see in a photograph but that you could feel when you pick it up. 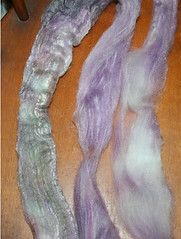 Dyeing just makes it more so in most cases, that’s not to say it’s felted. 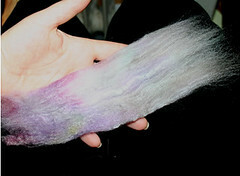 Felted fibers are not sellable as spinning fiber. My general choice to predraft this particular top (not considering the color) would be to strip it into manageable sections – at most 4 times. Tops like Corriepaca, alpaca, BFL and others really in my opinion don’t need to be predrafted other than to make them easier to manage or to get the color you want.. If I go to Etsy or Ebay or even many websites out there, roving is a word used to encompass all types of fiber that is in this long attenuated shape. It’s not all roving. I understand that roving is a word that is taking over it all but I’m betting most of what is out there is actually top but being called roving. It helps to know what you are getting when you buy. Roving is carded fibers attenuated into a long cylindrical thing. 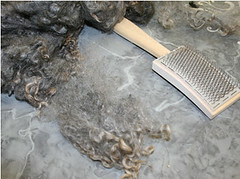 Top is combed, continuous, untwisted strand of fibers of one length. 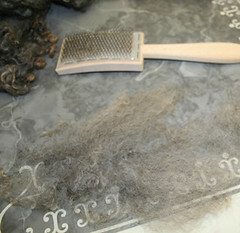 Most all of the short fibers or noils have been removed. Just from that definition you should be able to tell the difference. But for a visual you can pull out a bit. Please don’t do this at your local shop or at a festival. Do this with your own fibers or with the permission of the shop owner. 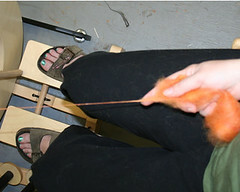 This is “Roving” – The fibers are visibly jumbly. Personally when I get roving, I spin without predrafting. The only time I will have to predraft is if it’s a compact roving. But then we get into buying good fiber. 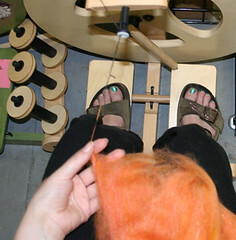 Personally, I turn away from roving that is not fluffy and easy to spin. I’m pretty picky about my fiber in general. I want to know that if I wanted to grab a hunk, I could just sit down and start spinning. I don’t want to HAVE to predraft. Though many times I do predraft and you’ll see me make little nests of fiber. I do this so that I have the color variations I want. Naturally colored fibers I generally break off a bit and spin as it is. I still draft at the wheel no matter how I pre-draft. Personally I find spinning from the corner gangly. Or maybe it’s just me that is gangly. I prefer to break it up in some way so that I can more easily hold it. This method can be done with top or roving as well. It’s a good way for some people to be able to learn long draw. Fleece is the stuff that is shorn off the sheep but not yet prepped for spinning. Though you can spin it as is which is called spinning in the grease. To spin in the grease or from washed locks you grab a small handfull off the big bunch. You can spin directly from that bit of fluff. Of course, in the grease it has lanolin that will coat you and your wheel. Still it’s a different method and your hands will come away much softer for it. I know there are many opinons and many different ways to handle the pre-draft. I’d be happy to hear all opinions or questions. I know I didn’t go into all fiber types either. I’ll save that for another post if there is interest. Thanks for this post! Very helpful! 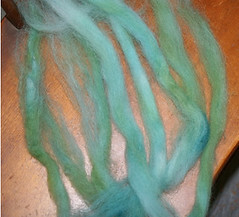 I have piles of raw fleece I couldn’t resist and want to spin it without much processing. I tried carding some lovely peach color and found it lost its hue. More, please……….. Many thanks for the clear explanation. I tend to predraft more than most people, but I have an excuse. I have a nasty form of arthritis, and my specialist encourages me to continue spinning and knitting to keep my hands and feet flexible. So, I have to pre-draft enough to ensure that drafting at the wheel does not exert undue stress on my fingers, and I’ve discovered that it takes very little to exert “undue stress”. I also tend to pre-draft just before I start spinning for the day as it seems to ‘break the tension’ and I don’t have to do so much pre-drafting and drafting at the wheel is easier. 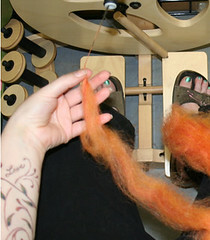 I’ve also learned to be very light-handed when I spin; I hold the top lightly and draft lightly. Oh, the things we go through to feed our passions!